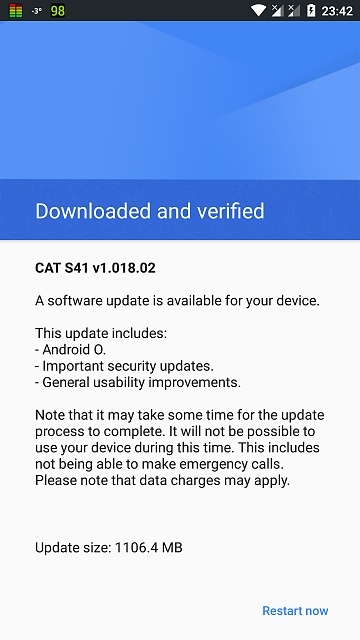 Will the CAT S41 get Oreo? 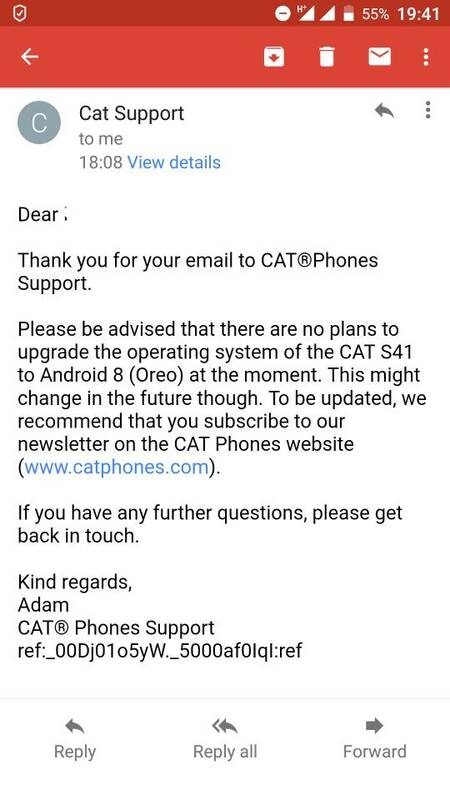 I am wondering whether my S41 will get Oreo. I doubt it, considering that my father's S60 never got upgraded from Marshmallow (it only gets security updates). 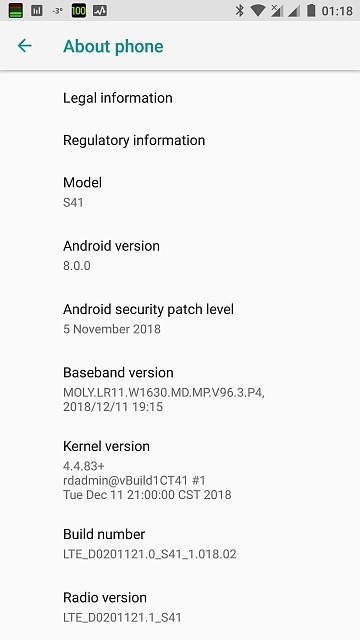 Not getting Oreo on the S41 (powered by the very decent Helio P20) is inexcusable considering that low-end devices with the MT6737 and MT6737T are coming pre-loaded with Oreo. I'd be surprised if anyone knew the answer to that question. 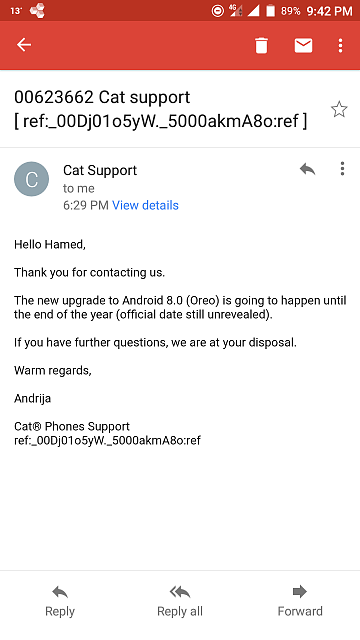 You might have some luck in contacting CAT for support (or maybe your mobile carrier, provided you purchased it from them). And TBH, I would be surprised if it does get an OS update at all, it seems to be still on 7.0,not even 7.1. People who buy these phones are usually doing it for the ruggedness of the device and outdoor business uses. I have seen a lot of Security Guards at office parks with the S61 in particular to capture information of entrants. These things are not bought for the software. It's not about the SoC at all. I got it because I needed a water proof phone that could also run both in hot sun and in extreme negative temperatures without issues. I guess I will contact CAT support. The S61 has Oreo and they promised P as well. Nougat is still an excellent OS, but newer systems are more secure and the adaptive icon stuff sounds cool. Hamed_Ale and Brice QUILLERIE like this. Will download when I got time and will report back! I installed it an hour ago and it works great, aside form a 10k point decrease on Quadrant, but that just Oreo being itself. Oreo is even letting me run some stuff I though could only run on my Oreo tablet! Bootup is at least 5-7x faster than Nougat. Nougat is like "snaildroid" compared to Oreo. Updated 5 days ago, and android auto not working anymore, any suggestions? Why would you use Quadrant when it's not even fully optimized for the latest devices and SoCs? For nostalgia. I use AnTuTu and Geekbench for normal benchmarking. I just noticed that Oreo DECREASES Quadrant scores and found that interesting. The score may decrease due to driver updates and the way Oreo may deal with SoCs. I've tried lot of things but AA is still not working ; any idea ? Did you try Phone > the three dots at top right > Settings > Sounds and vibration > remove the mark for 'Also vibrate for calls'? yep, it is not checked, but I think it is related to vibration when ringtone is on. So no effect for my problem. Android Auto is also affected... it crashes and the phone reboots as the car try to connect. Is there an easy way to roll back to nougat where everything was normal and useable? Well, 'Also vibrate for calls' is exactly for that - to make a vibration when the other side pick up. I use my phone with a mark for 'Also vibrate for calls' and that is why I haven't noticed any difference after the Oreo update. I think this should be considered as a bug. My advice is to write to CAT support and to describe to them that 'Also vibrate for calls' does not work as expected. About Android Auto I cannot tell any thing because I don't use it. As other people have the same problem, it also may be considered as a bug. And you may write to CAT support for that problem, too. CAT released a fix for the problem with SD card formatted with exFAT which appeared with one of the previous updates. If more people write to them I suppose they will release fixes for these new problems, too. As far as I know there is not a way back to Android 7. "In regard to your query, please be advised that the notifications and excessive vibrations were implemented by Android for Android 8. There aren't any ways to disable these entirely which we apologise for but we have brought this to the attention of our superiors who confirmed this was related to the Android. We apologise for being unable to assist you on how to disable this." I didn't get any information about AA problems so far. Huh, another catphone user! I have the S30 and to be honest I don't really like it. Yes, it's tough, yes you can get it pretty wet (5 metres allegedly) and it's certainly tough! The bloody software is a watered down version of Marshmallow, the thing destroyed me media in my SD card, and you need a bloody app for even the most basic things. I have also problems with this new update to Android 8.0 on my S41. Android auto doesnt works and also i can not make photos using Whatsappp. I had send a lot of e-mails to cat support but they always answer with "we are working on it". Multiple apps opening in the background - and I cant stop them!! Please Help!! I have a Huawei P8 Lite 2017. How do I save online images into the Gallery? which is the best screen protector for samsung s8+ that doesn't crack from falling off the bed?